Joseph McMaster was the youngest son of Henry McMaster. Joseph was born about 1895 in Ballynany, Favor Royal, Ballygawley, County Tyrone. Joseph’s mother died sometime between 1897 and 1901. Joseph’s father was a farmer. 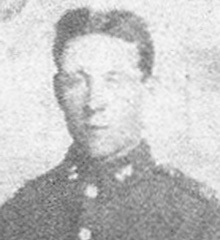 Joseph McMaster enlisted in Omagh. Private Joseph McMaster was serving with the 9th Battalion of the Royal Inniskilling Fusiliers when he was killed in action on the first day of the Battle of the Somme on 1st July 1916. Joseph was 21 years old.